All eyes are on US trade policy as the country moves to protect its own interests. NAFTA is being renegotiated. Tariffs of 25% and 10% have been imposed on steel and aluminium imports, including for key US allies, Canada, Mexico, and the EU. Negotiations are being conducted with China to restrict exports from China to the US and to level the playing field in intellectual property. At the same time, the import of automobiles from the EU is being investigated by the US on a national security basis, increasing the chances of further retaliation. Despite this, world trade is continuing to grow robustly – we forecast 3.5% growth this year. While US trade policy is increasingly biting, there is not (yet) pain on a national or global scale. In addition, negotiations of new trade agreements are accelerating. Global trade rapidly accelerated in 2017 to 4.5% from a mere 1.4% in 2016. The US led the rebound, growing 4.1% compared to 0.2% the year before. Eurozone trade bounced up to 3.5%. Emerging economies in Asia and Latin America did even better increasing 7.3% and 4.9% respectively, while Eastern Europe outpaced them all rising 8.9%. The strong rebound in 2017 was in part catch-up. 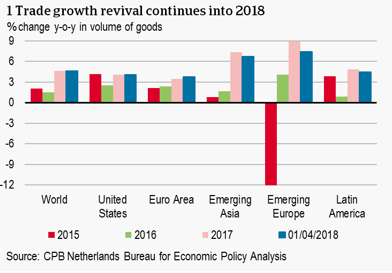 Therefore, in 2018 and 2019, we expect global trade growth to decelerate slightly, but remain solid around 3.5% on average. The global export orders indicator stood at 50.7 in May, indicating a further expansion in international trade. The Baltic Dry Index, which proved a good predictor of the turning point in trade growth in mid-2017, is moving back in an upward trend after a more-than 750 point fall between December 2017 and March 2018, and remains in comfortable territory. Together, these indicators support our own trade growth outlook: robust but decreasing slightly. This rosy outlook is driven by a number of fundamental factors. First, economic policy uncertainty is relatively limited at the moment, after a peak in early 2016. This holds true at the global level, in the EU, and – perhaps surprisingly – the US. It means economic decision-making is under relatively normal levels of uncertainty. This is particularly favourable for investments and thus international trade due to the trade intensity of investment. Second, the US economy is enjoying robust and increasingly broad-based growth, with investment picking up strongly due to lower policy uncertainty and higher energy prices. This is expected to persist into 2018 and 2019 as tax reductions and higher government spending incentivise further investment. Exports could also receive a further boost if the currently overvalued US dollar weakens. Third, China is continuing to significantly contribute to global trade. In 2017, Chinese exports grew 6.8% and imports 7.3%. These figures are expected to moderate in 2018 and 2019 as the composition of GDP shifts in favour of services, but should remain high. Following the financial crisis in 2008, a mountain of protectionist policies were implemented. Since 2014, these policies have been phasing out but the pace is slow. This trend could very well reverse itself should the more protectionist policy stance in the US be implemented. Tariffs on steel and aluminium imports were announced by the US administration at the beginning of March – covering approximately USD 62 billion worth of imports. The moderate economic advisor, Gary Cohn, was also replaced by the more hardline Larry Kudlow. Now there is wind in the sails of the US’s more protectionist trade policy. The US administration is committed to addressing the country’s trade deficit – particularly the USD 375 billion (goods) deficit (goods only) with China – and is in part using national security concerns as means of achieving this. Other countries are reacting – upping the ante, but in a very targeted fashion. At first, only steel-exporting China imposed tariffs on their own imports of aluminium, steel pipes, fresh fruit, and pork from the US – an import value of USD 3 billion. But now other countries are following suit, in response to the decision not to extend the metals tariff exemptions for Canada, Mexico, and the EU. Now retaliatory tariffs are being implemented, especially on iconic American products manufactured in politically sensitive regions like orange juice, jeans, motorcycles, and bourbon on top of steel. The potential introduction of a 20% tariff on automobiles, currently being considered by the Trump administration, would be a serious escalation. Negotiations with China are ongoing, as additional bilateral tariffs continue to be introduced as some concessions are made, and the risk of escalation continues to increase. The more inward-looking commercial policy of the US to ‘protect’ its own interests is taking shape and is beginning to be felt. The question is whether this policy, in its current – still limited – intensity, will significantly drive down the growth expectations of world trade. After all, the announced tariffs only concern a (very) small portion of the more than USD 17 trillion worth of annual world trade. Furthermore, tariffs would depress some but not all trade in the targeted goods: some would still go to the US while some would simply find a different destination. There are of course underlying trade flows that would amplify the effects. Uncertainty surrounding further trade restrictions would also affect investments which are important for trade. But at this point, we consider the effect on total international trade to be limited. Finally, US trade policy initiatives are only now getting off the ground, but fears have been floating around the markets since the election of President Trump. The EU anticipated this and has intensified talks to introduce new or renew existing trade agreements. This involves Japan and Mexico, with which the negotiations have already been successfully concluded. With Mercosur (the trade bloc in South America comprising Argentina, Brazil, Uruguay, and Paraguay) the negotiations are in their final phase. South American countries are also continuing their path of trade integration. The CPTPP, the successor of the proposed TPP which fell through when the US withdrew itself in 2017, was signed in early March in an accelerated process. These developments offer a clear counterweight to those in the US. However, the positive effect is only expected to be felt in higher trade growth in the longer term though.